Courtroom dramas are not a staple of Korean cinema, which is somewhat surprising given the tumultuous relationship between the social elite and corruption. And yet, in the past two years two prominent films based on real events have emerged – Silenced (AKA The Crucible) (도가니), about the sexual abuse of deaf children, and Unbowed (부러진 화살). Politically-charged, socio-cultural critiques are a huge reason why Korean cinema attracted such attention during the late ’90s, and while contemporary output has been much more commercially driven, it appears the industry could be moving back to what made Korean cinema so initially unique. If this is indeed a movement, then Unbowed is certainly part of it. Unbowed, by director Chung Ji-young (정지영) who returned to the helm after a thirteen year absence, is based on the true story of a professor whose trial for unfair dismissal was rejected. Upset with the verdict, the professor challenged one the judges outside his home with a crossbow. The story, understandably, made headlines; but as time passed it became clear that the story reported in the press and the truth were markedly different. Director Chung Ji-young – who also co-wrote the screenplay with Han Hyeon-geun (한현근) – presents the tale of Professor Kim Gyeong-ho (김경호 교수, Ahn Seong-gi (안성기) and his defence lawyer Park Joon (박준 변호사, Park Won-sang (박원상) with a highly effective stark social realist aesthetic, much like the very logical, no-frills protagonists themselves. The result is a courtroom drama where the facts speak louder than any directorial style, and the infuriation when clear violations of the law are committed are palpable. However, the focus and development of the central two protagonists is stunted due to far too many characters and secondary narrative elements inhabiting the story, forcing the impact of scenes, and the film overall, to become lessoned. 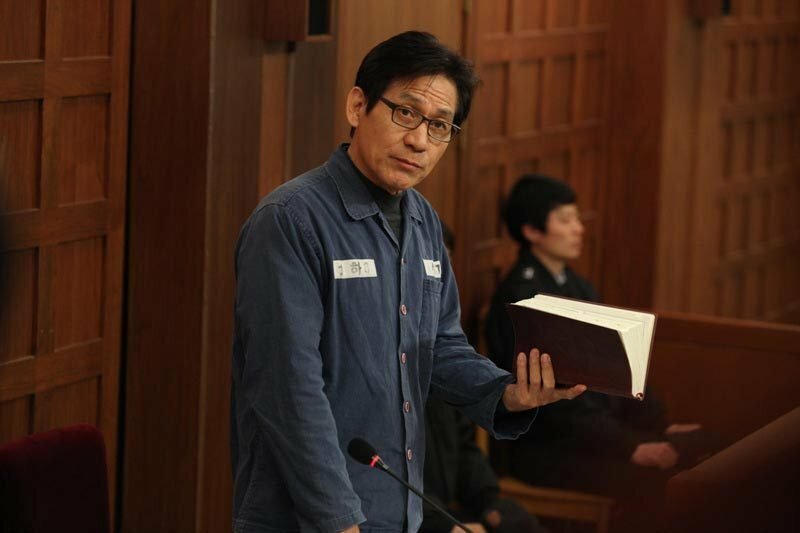 Interestingly, director Chung Ji-young opens Unbowed with the very event that made headlines as Professor Kim confronts the judge from his case with a crossbow. Yet rather than portray the entire confrontation from beginning to end, the professor’s subsequent incarceration is edited in as well as the journalism that appeared once the incident became public knowledge. While initially a tad frustrating, it becomes readily apparent that the filmmakers wish for the facts – rather than artistic license – to drive the narrative as well as the audience’s desire for more information. This is certainly a noble attempt, yet as the names of those involved as well as other features have been altered this is somewhat undermined. 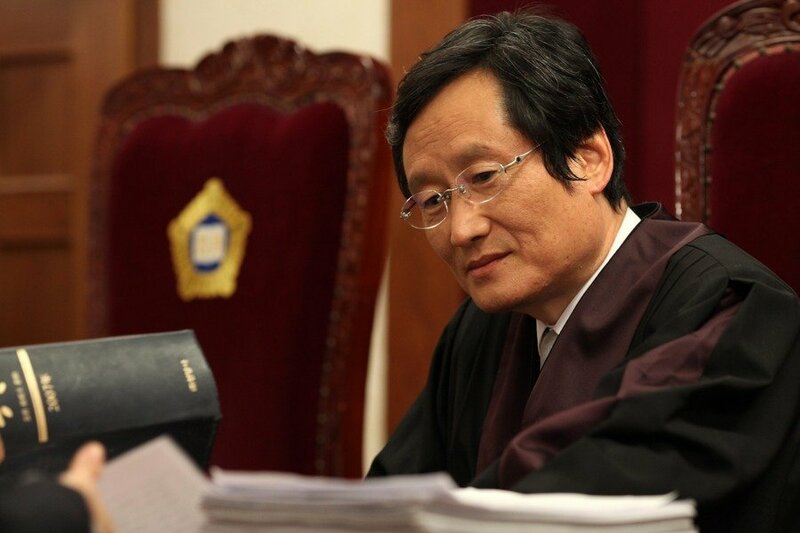 Luckily such a contradiction doesn’t detract from the overall narrative as from the outset the blatant disregard of the law by judges and lawmakers, the questionable evidence and Professor Kim’s charismatically stubborn refusal to submit continually shines through. Likewise the casting of Ahn Seong-gi (안성기) as the professor is a masterstroke, who brings his incredible likability to the role yet also stretches himself into new territory conveying such a highly logical, intelligent, and occasionally cold protagonist with the utmost sincerity. 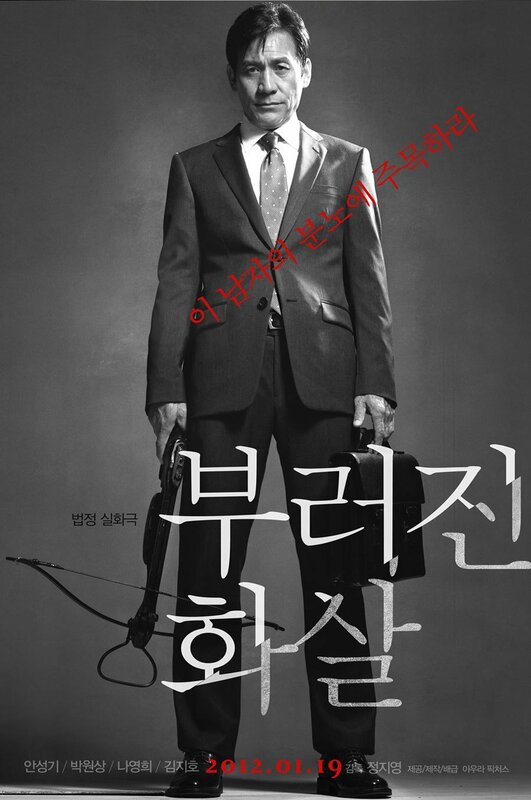 Unbowed largely succeeds due to the character of Professor Kim. Ahn Seong-gi portrays him as a humble yet highly intelligent man, a man of principals and ethics undaunted by the challenges before him. Scenes in the courtroom are wonderfully shocking and amusing as the Professor admonishes the judges for cutting him off during speeches, or for simply disregarding the law. An understanding of Korean culture, where seniority is incredibly important, makes such sequences all the more entertaining and are unfailing in creating a triumphant underdog narrative. Similarly the flashback scenes establishing the case, including the Professor’s time at university, prior court cases, and even family scenes, construct him as a genuinely likable and modest man, who simply wants nothing more than fairness for his students, his countrymen and women, and himself. However, the best examples of the courtroom drama convey how the case fundamentally changes those involved and in this sense Unbowed stutters. From the outset Professor Kim is, despite his stubbornness, a great man which leaves little room for character development. There is only one instance where the film takes a decidedly dark tone for the protagonist, yet what occurs takes place off camera and the ramifications are only alluded to and not explored, which is a missed opportunity. Yet this lack of examination is also due to the great deal of focus bestowed upon defence lawyer Park Joon, who fights for the Professor’s freedom in his own unique manner. Professor Kim’s relationship with defence lawyer Park Joon forms an integral part of the film and is executed well, with Park Won-sang (박원상) highly competent in the role. The actors respond and play off of each other well, although they manage to form their alliance quite quickly and easily despite their protestations to the contrary. Oddly, the narrative often seems more concerned with Park Joon’s story as he must battle alcoholism, the bankruptcy of his company, the tug of war between his wife and an attractive journalist, and his disillusionment with the law due to a past mistake. If all this appears too much then you’d be correct, as there are so many narrative tangents that add precious little to the main arc that their inclusion is often quite redundant. It also comes at a price, as genuine character development is sacrificed in order to accommodate so many threads. The lawyer’s love interest, in the form of journalist Jang Eun-seo (장은서, played by Kim Ji-ho (김지호), is also critically underused as she offers little more than a female presence rather than a crucial figure in the development of the case. Additionally, Park Won-sang is unfortunately required to provide comedic relief, and despite these scenes acting as brief interludes they are generally a wholly unnecessary distraction from the Professor’s story. That said, as the trial begins to gather pace and focus is applied to the final verdict, Unbowed recaptures the verve and vitality that makes the story so compelling and enthralling. Unbowed (부러진 화살) is a highly entertaining courtroom drama, filmed in a modest social realist aesthetic by director Chung Ji-young and featuring a charismatic and articulate performance by Ahn Seong-gi. Both of these features work wonderfully together in portraying the based-on-true-events narrative, adding realism, sincerity, and credibility to the plight of the Professor as well as highlighting corruption within the Korean legal system. While too many narrative threads involving defence lawyer Park Joon overburden the main arc, Unbowed is a great example of a Korean courtroom drama done right.